From spoofers to stratters to shavers, Pokémon Go has a Gym problem only a complete redo from Niantic can fix. Last weekend a group of "stratters" raided a local neighborhood and quickly took over almost a dozen Gyms. I joined a large group of legitimate players and had a tremendously fun afternoon trying to get the Gyms back. Until we got to the fifth Gym and saw the first two being taken again — by "spoofers". It made several of the legitimate players question whether or not they should stay legitimate, quit, or become stratters or spoofers themselves. And therein lies the problem with Pokémon Go's current Gym system and the reason it's being redone. 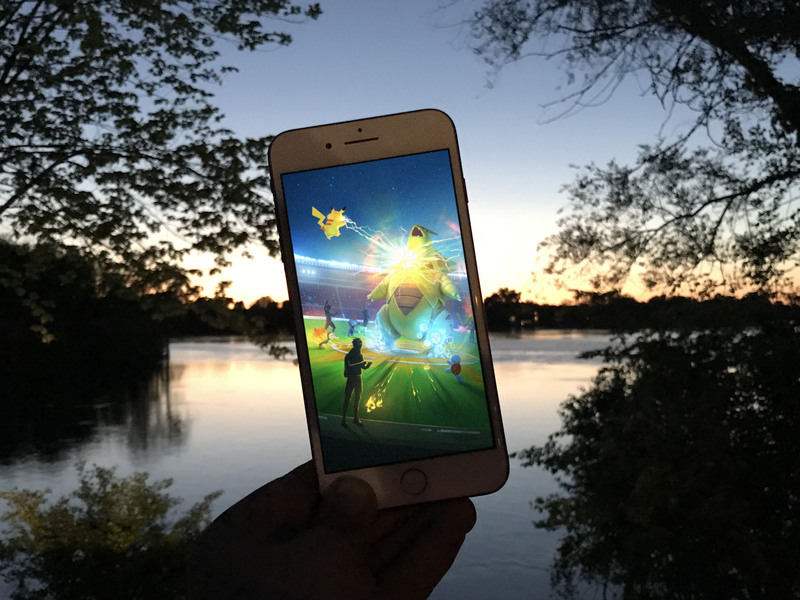 It's no secret that Pokémon Go is working on a new system for Gyms — the virtual towers layered over real-world locations that teams battle over for control, rewards, and renown. These include monster trading and player-versus-player battles. These are on the way, says Hanke, who adds that if the servers hadn't been so sketchy at launch, at least one of them would already be out there, likewise a gym battle system, supplementing what he feels is a "rudimentary" version of the game they envisioned. "It's going to be done soon," he says. "It is what it is. I'll take the massive wave of hysteria we enjoyed, and just deal with the fact that it's caused us to take a bit longer to get the rest of the features up. We're really happy to make our users happy." Hopes for that are high among the still-massive player base, because many players seem to find the current system not only broken but deeply frustrating. With that in mind, over the course of a month, I joined up with some locals on the same team, met some other teams both online and in real life, and competed in dozens of Gym raids and reclamations. After scores of discussions and hours of observations, a few things became clear — not just about what was currently broken, but why. When Pokémon Go first launched, it was wild, heady fun. Everyone was playing, having a good time, and a wide variety of Pokémon at all different power levels could be seen on Gyms. Those Gyms would also change teams frequently and you could often count on walking by, seeing a freshly turned over Gym, and adding your own Pokémon — or turning it back. Pokémon Go incentivized Gyms by offering 10 PokéCoins and 500 Stardust, both valuable in-game resources, as a reward to any player in a Gym, up to a maximum of 100 coins and 5000 Stardust for 10 Gyms, once every 21 hours. It also positions Pokémon in Gyms based on their power level. So, the higher the level, the higher the position, and the harder the Pokémon is to remove from the Gym. That led to everyone racing to get and power up the Pokémon with the highest potential, so they could last in Gyms longer and have a better chance at being in multiple Gyms, hopefully maximum Gyms, when they chose to claim their reward. It eventually led to some monotony, but overall it remained fun and sometimes frenetic. Then, the spoofers came. The goal of Pokémon Go was to get people out and about, to explore their neighborhoods, discover local points of interest, and run into neighbors they'd never taken the opportunity to meet before. Soon, though, people began to discover that they could hack the system to play from home. All they had to do was "spoof" their GPS location and they could play remotely, anywhere, any time. It was easier and faster than going out, and they could get powerful Pokémon, level up, dominate Gyms, and claim the rewards without even having to leave their desks. While Pokémon Go did ban "botters", or those who ran massive amounts of scripted accounts, despite continuous reports of abuse, most spoofers never seemed to suffer any consequences for breaking the terms of service. So, over time, they grew in number and began to take over and harass more and more Gyms. Watching Gyms go up and down with no humans around started to frustrate and anger legitimate players. Eventually, those players began to organize in groups to try and beat back and drive away spoofers. To do that efficiently, they turned to "bubble-strat". That's a strategy designed to game the system where two or more extremely low-powered Pokémon, one less than half the power of the others, are used to quickly bring a Gym up to level 10. Faster than anyone else, including a spoofer, can bring it back down. It only really worked when the organized teams could show up at a location in numbers, though. When that became difficult to sustain, they began to share account information so only a few of them needed to actually be there. That way, a handful could take the Gym, bubble-strat it up, and then add all their absentee teammates, ensuring a level 10 Gym. Next, since bubble-strat required at least one or two teammates to leave extremely low powered and vulnerable Pokémon on the Gym, they began to use accounts from alternate teams. That way, when they finished the bubble-strat, they could switch to the alternate team account, take off their low-powered Pokémon, and replace them with high powered ones. Over time, some of the teammates, family, or friends whose accounts were being used stopped playing, or more accounts were needed, so it ended up being just a few people essentially using multiple accounts all on their own. Although also a ToS violation, Niantic never seemed to catch or ban anyone for using multiple accounts, so the people who did it took it as de facto acceptable and extremely clever game strategy. Of course, once the organized teams could easily take a Gym back from spoofers, they could also take start taking Gyms from other legitimate players and teams as well. The sudden presence of both spoofers and organized teams knocking down and building up level 10 Gyms quickly and efficiently effectively froze out lower level and solo players. So, some of those players began to accumulate alternate team accounts as well. Not to bubble-strat but to "shave" or "cycle". They'd approach a level 10 Gym controlled by their own team, switch to their alternate account, knock off the lowest powered Pokémon already on it, and then switch back to their real account and put one of their own Pokémon in its place. The people getting shaved/cycled off then got frustrated and angry, and some started to shave/cycle themselves back on. Eventually, even though a Gym continued to be controlled by the same team, the actual Pokémon on that Gym began to change regularly. And, as time went on, and more and more people joined in, the speed of the changes got faster and faster. Spoofers, being human as well, also became frustrated and angry by the bubble-stratters who took away their Gyms and the shavers/cyclers who took away their spots. So, they began to create more accounts. With 10, 20, or more accounts, a spoofer could bubble-strat with the best of them and do it faster as well. That let them take back Gyms from the organized teams. They also started shaving/cycling as well, so they could take or take back spots on Gyms the same team already controlled. Of course, that further frustrated and enraged the organized teams, which led to escalation. Instead of just putting any high-powered Pokémon on the Gyms, the teams started using maps to hunt down and catch Blissey and Snorlax, the two toughest Gym defenders in the game. Spoofers, then, began doing the same. And with the benefit of GPS-based "sniping" — the ability to "teleport" to any location, grab the most powerful Blissey and Snorlax, and teleport back, all instantaneously. Spoofing and bubble-stratting had a side-effect: As Gyms became trivially easy to take down and replace, the spoofers and stratters began to get bored. To keep themselves interested, some spoofers and stratters started racking up absurdly high numbers of Gyms. Although Pokémon Go only allows you to collect rewards from 10 Gyms every 21 hours, maximum, there's nothing in the game that stops any player from being on 20, 30, or even more. And since spoofers and stratters tend to have large numbers of high-powered Pokémon, they can easily hold that many Gyms at one time. That effectively froze casual players out of Gyms, leading some to start shaving/cycling to get on existing Gyms, others to start spoofing or joining a bubble-strat team, and yet others to simply quit. Worse, some turned to griefing as a way to retaliate or simply amuse themselves. They'd hunt other players instead of Pokémon, singling out their targets, and trying to make them miserable so they'd quit the game. Over time, all of this makes it harder and less enjoyable for legitimate players. Those that don't quit or give in and become a spoofer or stratter soldier on, hoping Niantic will eventually address all the exploits in the system and those that exploit them. And that creates a lot of ill-will in the community. Anyone who's less successful at exploiting the system, or simply chooses not to, is called a whiner or complainer. Anyone who's more successful at exploiting the system is called a cheater. Yet each individual tells themself they're simply competing better, smarter, with more nobility, or more legitimately than anyone else. It's what can happen to any system that's poorly incentivized and left to its own devices, absent moderation, consequences, and proper behavioral modeling. And it's very much hoped Pokémon Go's new Gym system will fix it. Not just with tweaks but with mechanics designed from the start to promote the kind of gameplay and community Niantic says it wants.